Well, this story floated into my email this morning from Health Freedom Alliance. Thank heavens, I thought. Hope has emerged again. Health Freedom Alliance » Success! Best Known Peer-Reviewed Medical Journal Officially Classifies Fluoride As A Neurotoxin. Fluoride harms developing brains–among many other damages that it does. There is plenty of science now showing that one to one cause and effect. I put three essays about the danger of putting fluoride into our water system on the blog a few years back–Mainely Tipping Points Essays, 34 to 36–using the text THE CASE AGAINST FLUORIDE: HOW HAZARDOUS WASTE ENDED UP IN OUR DRINKING WATER AND THE BAD SCIENCE AND POWERFUL POLITICS THAT KEEP IT THERE (2010), Paul Connett, PhD, James Beck, MD, PhD, and H.S. Micklem, DPhil, In the essays, I cite the formidable credentials of these three authors–all of whom are now senior scientists. Astonishingly, Connett et al report that no federal agency accepts responsibility for the safety of fluoridation. The Food and Drug Administration (FDA) has never approved fluoride for ingestion and rates fluoride as an “unapproved drug”—which is why it can mandate the toothpaste warning. Nor has the FDA subjected fluoride to rigorous randomized clinical trials for either its effectiveness or its long-term safety (270). At the Center for Disease Control (CDC), only the Oral Health Division (OHD) is involved with fluoridation, and the OHD is staffed largely by dental personnel. In 2008, Connett et al note, not one of the 29 staff members had scientific degrees qualifying them to assess the toxicity of fluoride, yet this division aggressively promotes fluoridation throughout the United States (23-24). The Environmental Protection Agency (EPA) has an indirect role in that it regulates safe standards for all “contaminants” in drinking water. In 2002, as it is legally required to do every 10 years, the EPA asked the National Research Council (NRC) to review the current 4 ppm (parts per million) Maximum Contaminant Level (MCL) standard. The NRC appointed a 12-member panel that, the authors state, was “the most balanced ever appointed in the United States to do any kind of review on fluoride” 137). This panel issued its 507-page report in March 2006, in which it declared that the seemingly low-level 4 ppm maximum standard was not protective of health (25). The ADA [American Dental Association] declared the NRC report irrelevant to water fluoridation on the day it was released—claiming erroneously that the panel only reviewed water fluoridation of 4 ppm. The panel, in fact, “examined several studies that found adverse effects at levels less than 2 ppm” (138). The CDC followed six days later with the same conclusion. To date, write the authors, the CDC has produced “no comprehensive analysis to support its claim.” And “it’s hard to believe that in six days Oral Health Division personnel could have read and digested the report, let alone its over 1,100 references” (140). Ironically, in 1999, the CDC “finally conceded what many dental researchers had been reporting over the previous two decades: Fluoride’s predominant mechanism of action was topical, not systemic. In other words, if fluoride works at all, it does so via direct exposure to the outside of the tooth and not from inside the body” (13). So, write Connett et al, to continue “the practice of forcing people to ingest fluoride has become even more absurd (269-270). BUT, even the ADA, in fine print on its web site, warns against feeding baby with formula mixed with tap water because the fluoride levels are too high for infants. YOU CANNOT CONTROL THE DOSE OF THIS TOXIC MATERIAL WHEN YOU PUT IT IN THE WATER–and that affects infants, the elderly, the infirm, and anyone who drinks a lot of water. What is particularly GALLING to me is that putting fluoride into our water has always been a POLITICAL DECISION–not a scientific one–which is totally demonstrated by Connett et al in their book. What is doubly particularly GALLING is that the most recent scientific review, as stated above, commissioned by the EPA and carried out by the National Research Council, raised at least a dozen red flags about the efficacy of fluoride at all and the use of fluoride in the water. 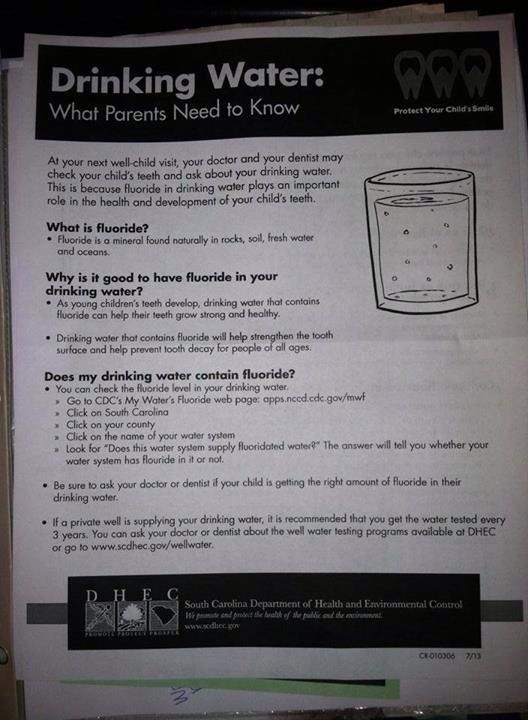 Yet our public health officials, who get their information from the big health organizations–most of whom have gotten themselves way out on a shaky legal limb with regard to fluoride–have clearly NOT READ for themselves recent information on fluoride, to include the recent NRC study. AND, when a local jurisdiction gets a referendum on fluoride, the local public health officials, including MDs and dentists, come out of the woodwork supporting fluoride and throwing around their “health” credentials. This behavior happened in Damariscotta a few years back–and it was clear that not one of these folks had read the most recent EPS/NRC report. And we all must remember that doctors and dentists are PRACTITIONERS, not scientists, and public health officials know only what they have been taught and that if they deviate from what they have been taught, they can lose their jobs. So, cheers to The Lancet! No Well Waters are safe or suitable for animal consumption and plant growth, because one small glass of Well Water, on average, contains the Fluoride equivalent of one pea sized dab of Fluoridated Toothpaste, Fluorides are harmful in any amount, and there is almost always more than 0.7 parts per million of Fluoride in all Well Waters. Thanks. It’s very interesting to me that traditionally people drank surface water, not well water. Springs, though, like artesian water, bubble up “from below.” Have to think more about the issues you raise. There is a lot of info on this blog about the history of fluoride in the US, the toxicity of it, etc. There are at least four essays on a major book by major scientists (whose title escapes me just at this moment) taking on these issues. They’re under the Mainely Tipping Points essays.